Air Force Research Laboratory (AFRL) - Responsible for the Air Force's science and technology program, including the full spectrum of Air Force basic research, exploratory development, and advanced development. AFRL employs more than 6,300 military and civilian personnel. 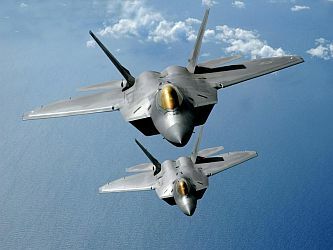 Its technological breakthroughs can be found in all of today's modern aircraft, spacecraft, and weapon systems, including the F-117 stealth fighter, B-2 bomber, C-17 airlifter, and F-22 fighter. AFRL has contributed to significant advancements in modern communications, electronics, manufacturing, and medical research and products. Analytic Services Inc. (ANSER) - Studies issues related to the research, development and acquisition of major Air Force weapon systems. Applied Physics Laboratory (APL) - A not-for-profit center for engineering, research, and development. APL is a division of one of the world's premier research universities, Johns Hopkins, but primarily a defense contractor. It serves as a technical resource for the Department of Defense, NASA, and other government agencies. The U.S. Navy continues to be APL's primary long-term sponsor. The Laboratory performs work for the Missile Defense Agency, the Department of Homeland Security, intelligence agencies, the Defense Advanced Research Projects Agency (DARPA), and others. Also see Wikipedia. Army Capabilities Integration Center (ARCIC) - Develops Army concepts that provide strategic and operational direction through the Army Concept Framework. ARCIC also supports Combatant Commanders by evaluating capabilities needed for the future force in a range of operational environments. Also see the The U.S. Army Operating Concept (AOC) [TRADOC Pam 525-3-1]. Army Research Laboratory (ARL) - Computational resources in support of the U.S. military. ARL's Army Research Office (ARO) serves as the Army's extramural basic research agency in the engineering, physical, information and life science, developing and exploiting innovative advances to insure technological superiority. Asymmetric Warfare Group (AWG) - Provides operational advisory assistance to Army and Joint Force Commanders to enhance the combat effectiveness. Aviation Applied Technology Directorate (AATD) - Develops, demonstrates, and applies technologies that enhance the capability, affordability, readiness and safety of DoD aviation systems. Center for Contemporary Conflict (USN) - Conducts research on current and emerging security issues and conveys its findings to U.S. and allied policy-makers and military forces. Launched by the Naval Postgraduate School's Department of National Security Affairs in 2001. Center for Naval Analyses (CNA) - A federally funded research and development center (FFRDC) for the Navy and Marine Corps. The Center also provides research and analyses services to other military and government agencies to help improve the efficiency and effectiveness of U.S. national defense efforts. Center for Strategic and Budgetary Assessments (CSBA) - Public policy research institute providing analysis on military strategy and policy, defense budgets and programs, weapon systems and critical technologies, military personnel and readiness, military revolutions and future warfare, transformation of the military, and the defense industry. Command and Control Research Program (CCRP) - Focuses upon improving the practice of command and control and enhancing DoD's understanding of the national security implications of the Information Age. Comparisons of U.S. and Foreign Military Spending: Data from Selected Public Sources [.pdf] - This report lists and compares military expenditures of the United States and foreign nations. Concept of Operations for a New Deep-Diving Submarine - RAND report on deep-diving research submarines. Defense Tech Briefs - An official publication of NASA and a powerful tool for engineers, managers, and scientists. The monthly magazine features exclusive reports of innovations developed by NASA and its industry partners/contractors that can be applied to develop new/improved products and solve engineering or manufacturing problems. Authored by the engineers or scientists who did the work, the briefs span a wide array of fields, including electronics, physical sciences, materials, computer software, mechanics, machinery/automation, manufacturing/fabrication, mathematics/information sciences, and life sciences. Defense Technical Information Center (DTIC) - The central facility for the collection and dissemination of scientific and technical information for the Department of Defense (DOD). DoD Base Structure Report [.pdf] (June 2003) - A summary of the U.S. Department of Defense's real property, installations and environments. Prepared by the Office of the Deputy Under Secretary of Defense. DoD Research & Development Descriptive Summaries Search (RDDS) - Basic Research, Applied Research, Advanced Technology Development, Demonstration and Validation, Engineering and Manufacturing Development, Management Support, and Operational System Development budgeted activities of the DoD. Environmental Research Aircraft and Sensor Technology (ERAST) - Developing unmanned aerial vehicle (UAV) technology and miniaturization of science instruments and sensors that can be carried by those aircraft. Managed by NASA's Dryden Flight Research Center at Edwards Air Force Base, Calif. Extremely Low Frequency (ELF) Communications Program - The ELF frequency range is important to the Navy because of its value in providing a way to communicate with submerged submarines. As a result of the high electrical conductivity of sea water, signals are attenuated rapidly as they propagate downward through it. In effect, the sea water "hides" the submarine from detection while simultaneously preventing it from communicating with the outside world through normal radio transmissions. Facts on International Relations and Security Trends (FIRST) - Databases on country organization memberships, conflicts and peace keeping activities, arms production and trade, military expenditures, weapons of mass destruction, armed forces and conventional weapon holdings, political system and country indicators, and other reference data. Human Terrain System (HTS) - A United States Army program which embeds anthropologists and other social scientists with combat brigades (currently in Iraq and Afghanistan) to help tacticians in the field understand local cultures using Human Terrain Mapping (HTM). Also see Wikipedia. Institute for Defense & Government Advancement (IDGA) - Dedicated to the promotion of ideas in public service and defense. Brings together speaker panels comprised of military and government professionals while attracting delegates with decision-making power from military, government and defense industries. Institute for Defence Studies and Analyses (IDSA) - Dedicated to research and policy studies on all aspects of defence and security. IDSA was established as a registered society in New Delhi on 11 Nov 1965. Institute for the Study of War (ISW) - Public policy research organization. Through reports and timely events, its research educates military and civilian leaders, reporters, and the public to enhance the quality of policy debates. Mapping Militant Organizations - This Stanford University research project traces the evolution of militant organizations and the interactions that develop between them over time. Findings are presented in interactive "maps," which provide both (1) visual representations of how relationships among militant organizations change over time and (2) links to in-depth profiles of individual groups. Maxwell Papers (USAF) - The Maxwell Papers, the Air War College's occasional papers series, focus on current and future issues of interest to the Air Force and Department of Defense. Militarily Critical Technologies List (MCTL) - DoD's systematic ongoing assessment and analyses of technologies to determine which technologies are militarily critical. From the Defense Technical Information Center (DTIC). Military Operations on Urban Terrain (MOUT) - MOUT is defined as all military actions that are planned and conducted on a terrain where man-made construction affects the tactical options available to the commander. Military Operations Research Society (MORS) - PHALANX Online, Monographs, MORS Symposium Abstracts. Missle Defense Agency (MDA) - MDA's mission is to develop and field an integrated Ballistic Missile Defense System capable of providing a layered defense for the United States and its deployed forces, friends and allies against ballistic missiles of all ranges in all phases of flight. MITRE - Manages federally funded research and development centers (FFRDCs): one for the Department of Defense (known as the National Security Engineering Center), one for the Federal Aviation Administration (the Center for Advanced Aviation System Development), one for the Internal Revenue Service and U.S. Department of Veterans Affairs (the Center for Enterprise Modernization), one for the Department of Homeland Security (the Homeland Security Systems Engineering and Development Institute), and one for the U.S. Courts (the Judiciary Engineering and Modernization Center). MITRE also has its own independent research and development program that explores new technologies and new uses of technologies to solve our sponsors' problems in the near-term and in the future. Naval Surface Warfare Center (NSWC), Dahlgren Division - Conducts analysis, systems engineering, research, test, evaluation, and integration of important naval and joint warfare systems. Office of Naval Research (ONR) - Coordinates science and technology programs of the U.S. Navy and Marine Corps through universities, government laboratories, and nonprofit and for-profit organizations. Pentagon Library - Fulfills the research, educational, and archival requirements of Department of Defense personnel serving at the Pentagon and NCR. Located in Washington, D.C.
Post-Conflict Reconstruction (U.S. Army War College Library, Virginia C. Shope) - This bibliography (11/2003) lists citations for books, documents, periodical articles, and Internet sites about post-conflict reconstruction in general, as well as materials describing the aftermath of war in the following countries: Afghanistan, Bosnia, Haiti, Iraq, Kosovo, and Somalia. Quadrennial Defense Review - From Department of Defense. Rand Arroyo Center - U.S. Army research and development center for studies and analysis. Rapid Airborne Mine Clearance System (RAMICS) - Mission is to rapidly neutralize near surface, floating and shallow bottom mines providing safe transit and operating environments for U.S. Naval Forces. Research, Development and Engineering Command (RDECOM) - The Army's technology leader and largest technology developer. Research, development and engineering of systems. NSRDEC - Located at the U.S. Army Natick Soldier Systems Center in Natick, Massachusetts, under the Army's Research, Development and Engineering Command (RDECOM). Dedicated mission to maximizing the warrior's survivability, sustainability, mobility, combat effectiveness and quality of life "by treating the Soldier as a System." Scientific and Technical Information Network (STINET) - Assists the U.S. Department of Defense access scientific and technical information. Soldier Systems Center (Natick) - The Army's one-stop soldier-support organization. Natick is responsible for researching, developing, fielding, and managing food, clothing, shelters, airdrop systems, and soldier support items. Strategic Studies Institute (SSI) of the U.S. Army War College - The U.S. Army's think tank for the analysis of national security policy and military strategy. U.S. Army Research Laboratory (ARL) - Consists of basic and applied research and survivability/lethality and human factors analysis. Technology and analysis products are moved into RDECOM RDECs and to other Army, Department of Defense (DoD), government, and industry customers. U.S. Army Land Power Essays - Covering landpower aspects of national security. U.S. Naval Observatory - Mission is to determine the positions and motions of celestial objects, to provide astronomical data, to measure the Earth's rotation and to maintain the Master Clock for the U.S. This webpage last updated on Saturday, June 2, 2018 1:12 AM.